Ballsbridge is arguably Dublin's most exclusive address. Streets such as Shrewsbury Road and Ailesbury Road boast the highest real estate prices in Ireland with asking prices of up to €50 million for a single property. The area has traditionally been the home of the majority of foreign embassies and diplomatic representations in Dublin. It is not hard to see why the rich and powerful come to Ballsbridge: Originally developed in Victorian times, the streets are wide and tree lined and houses are substantial and set back in vast private grounds. Of all Dublin areas, Ballsbridge has the least built-up and most 'private' feel. Yet, despite the space and relative tranquility, Ballsbridge is only minutes away from the city centre. The area is named after Balls Bridge, a three-arched cut stone bridge built over the River Dodder in 1791. Development began some fifty years later, when the Earl of Pembroke leased out his vast estates in the area and large red brick houses were built for upper class families. City politics at the time gave Ballsbridge its exclusive air: Planning regulations at the time decreed that houses for the working class were restricted to Irishtown and Ringsend to the North East of Ballsbridge. The Royal Dublin Society (RDS) was founded in 1731 with the aim to promote and develop Irish agriculture, arts, industry and science. Originally located in the city centre, the RDS moved to the newly developed Ballsbridge leasing 15 acres of land in 1879. The first shows took place in Ballsbridge in 1881. In 1926 the RDS held the first Aga Khan Trophy contest during its annual Horse Show. The Agha Khan Trophy has since grown to become the World's most prestigious contest for show jumping. In recent years, the RDS has widened its programme to house all sorts of events at its Ballsbridge grounds. Arts shows, musicals, rock concerts, fun fairs and ice skating rinks are just part of what the RDS offers. Ballsbridge is steeped in rugby. Nowhere else in Dublin will you find a similar concentration of rugby clubs and playing fields. Rugby originated in the 1820's at English universities. The oldest rugby club in Ireland is Dublin University, which dates back to 1854. Given Ballsbridge's nature as an almost exclusively upper class enclave in Victorian times, it is no wonder that the second rugby club would spring up here: The Wanderers were founded in 1870 by an ex-Dublin University player. Today, Ballsbridge and neighbouring Donnybrook are home to half a dozen active rugby clubs. Apart from the Wanderers you find Old Belvedere, Lansdowne, Old Wesley, Leinster Rugby Club and the Bective Rangers all practically within spitting distance from each other. Given Ballsbridge's taste for rugby, it is no surprise that one of the oldest international stadiums in the world is located here. The first international rugby match was held at Lansdowne Road Stadium as early as 1878. The first stand was added in 1908 and the stadium has been the home of Irish rugby until it closed down for a total rebuilt in 2007. The old Lansdowne Road stadium has been completely razed, giving way to a new, state-of-the-art 50,000 seater stadium. The new stadium is due to open at Lansdowne Road in early 2010. Following a ten year sponsorship deal with Ireland's largest insurance company, Hibernian Aviva, the Lansdowne Road site will now be called the Aviva Stadium. Herbert Park is a green oasis spread over 32 acres of prime Ballsbridge land. It is named after Sidney Herbert, the father of the Earl of Pembroke who owned the land that Ballsbridge was built on. Some features of the park date back to the Dublin International Trades Exhibition, a kind of mini World Fair held in Dublin in 1907. Herbert Park these days offers football pitches, tennis courts, boules, croquet lawns and a children's play ground to the public. Eateries and pubs in Ballsbridge concentrate around Ballsbridge village, which is located on Pembroke Road and Merrion Road, just before you get to the RDS. 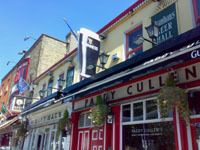 Pubs here include Paddy Cullen’s, Crowe’s, Mary Mac’s and Bellamy’s, all of which serve pub food throughout the day. Popular restaurants in Ballsbridge are Roly's Bistro, The Lobster Pot and the picturesque Bella Cuba. With so much multi-million Euro real estate close by, restaurants are relatively pricey and the cooking is on the staid, conservative side. The pubs around Ballsbridge are largely dominated by sports fans who are predominantly into rugby. Try the bar and restaurant at stylish new boutique hotel The Dylan for something a little different. More than half of the foreign embassies in Dublin are located in Ballsbridge. Some 29 out of 53 embassies are spread across Ballsbridge's leafy streets, including the American Embassy in Dublin, the British Embassy, the Embassy of France, the Embassy of Italy, the Embassy of Spain, the Polish Embassy and the Embassy Of The Netherlands. Ballsbridge can be conveniently reached by DART local railway services. The main DART stops are Lansdowne Road for the Northern parts of Ballsbridge and Sandymount for Southern parts including the RDS. The Sydney Parade station services the Southernmost tip of Ballsbridge at the top of Aylesbury Road. Bus routes 4, 5, 7, 7A, 7E, 8, 18, 45, 63 and 84 all go through Ballsbridge.